Between the 1940s and 1960s, the Asian and African countries succeeded in largely increasing grain yields through introduction of new varieties and improving cultivation methods, thanks to the so-called Green Revolution, a series of research and technology transfer initiatives to save people from starvation. 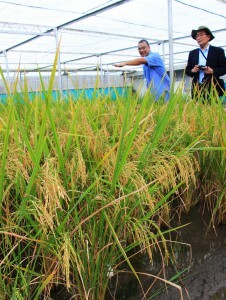 The International Rice Research Institute based in Los Banos, located 65km southeast of the Philippines’ capital city of Manila, is one of the major contributors to this movement. The institute is an agricultural research and training organization and a member of the CGIAR consortium, a global partnership that unites organizations engaged in research to fight poverty and hunger. Along with other rice varieties, the IRRI developed IR8, a new rice variety which drastically increased rice production in developing countries, helping raise the profitability of rice farmers and leading to increased food supply for the poor. In recent years, the institute is focusing not only on improving yields but also on developing high nutrition rice and varieties which are more resistant to stresses related to climate changes. In an effort to follow the path of the Green Revolution, the institute grows Golden Rice in its humid experimental paddies covered with insect proof nets in Los Banos. In the Philippines, where the annual average temperature is around 26 degrees centigrade, it is common in most regions to raise two or three rice crops a year. Double-cropping of rice and corns is also popular. Even in early February, the experimental paddies are filled with rice plants ready to harvest. Golden Rice is a new variety which is genetically engineered to be rich in beta carotene, a source of vitamin A, in the edible part of rice. It looks similar to ordinary rice plants, but its grains are deep yellow just like corns. It is said that a single bowl of Golden Rice can supply 50 percent of a person’s daily requirement of beta carotene. The new variety is developed to cope with the serious shortage of vitamin A among people, especially children, in developing countries. According to the IRRI, 670,000 children worldwide, mainly in Asian and African countries, die every year because of its deficiency. Raul M. Boncodin, the IRRI’s golden rice project senior manager, explains that the institute now has all the data necessary to cultivate the rice variety in the Philippines and it is ready to start commercial cultivation if it receives approval. Currently, a research institute in the nation is conducting experiments to domesticate the variety to fit the country’s climate conditions. At the same time, research is going on to cross breed Golden Rice with local rice cultures to create varieties with higher yields, quality and insect resistance. The IRRI also organizes the Golden Rice Project in cooperation with research institutes in Bangladesh and Indonesia as a collaborative effort to spread the rice variety across national borders. Beta carotene is usually taken into the body by eating beta-carotene-rich vegetables, but stable supply of such vegetables is difficult in many of Asian and African countries. Boncodin says since rice is grown in most areas worldwide, it will become easier for people to take in beta carotene if beta-carotene-rich rice becomes available. In 1999, a group of researchers in Germany unveiled Golden Rice which they developed by inserting beta-carotene-creating genes in rice plants. In 2005, a new variety called Golden Rice 2, which produces some 20 times more beta carotene than the original golden rice, was developed by a major seed manufacturer using a gene from corns. The company offered related patent information free of charge to the IRRI. The institute is also working on developing rice varieties which contain a lot of iron and zinc, so that the rice varieties can be provided in areas where people have to endure eating a diet with insufficient intake of such micronutrients. It has already succeeded in raising the iron content in a rice grain to a maximum of 7 parts per million, which is 2 to 4 times more than ordinary rice. 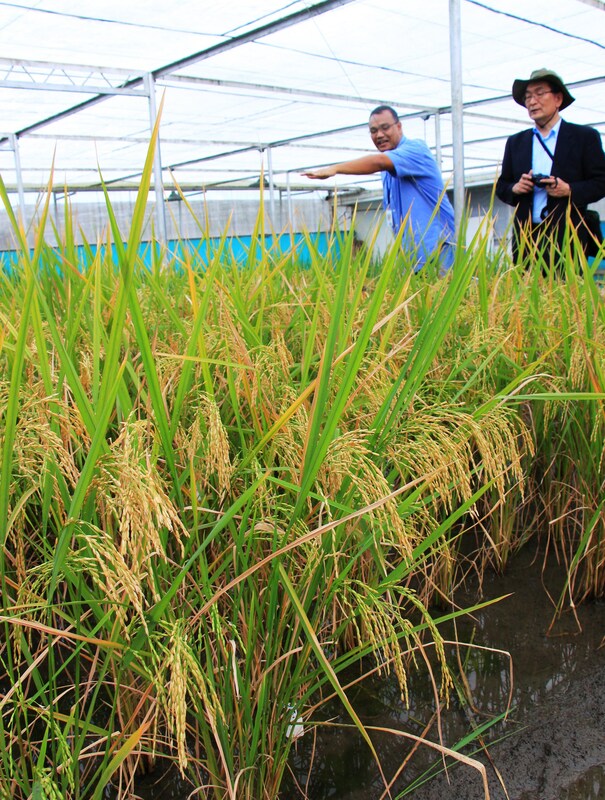 Their goal is to develop a rice variety which contains 14 ppm of iron, 3 ppm of beta carotene and 25 to 30 ppm of zinc.